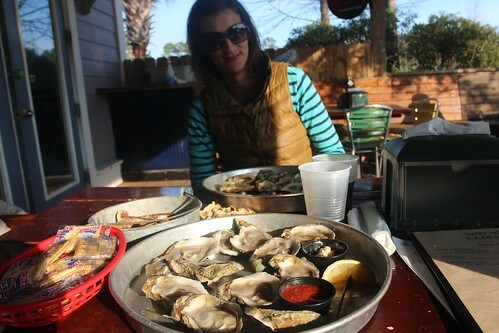 Mali Mish - Day 173: Back to Hurricane Oyster Bar for more. 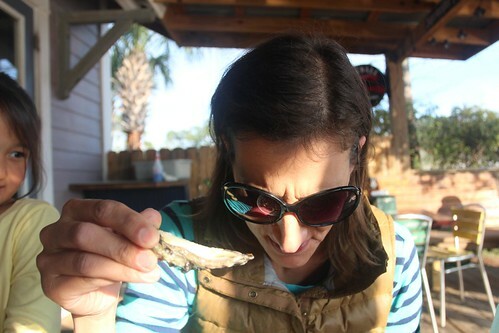 Day 173: Back to Hurricane Oyster Bar for more. This morning we are taking things slow. We spent a lot of time lounging around the Mish before the girls and Luka decided to meander around the campground and park looking for creatures. The rumor has it that there are bald eagles living somewhere in the park. 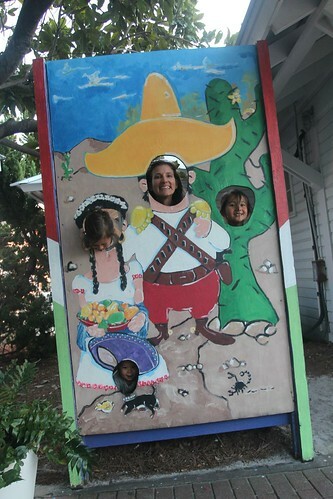 As I stayed back at the campsite, Marlene and the kids went out on a little adventure. After a loop around the campground with no signs of the bald eagles, Marlene decided to ask the park rangers to see if they had any clue of where they might be. Well, they looked at them as if they were the elusive national bird. I guess not every park ranger is into birds. Our late start meant a late home-cooked breakfast for everyone. That set us up once again for a late lunch at around 3pm. Since we got skunked yesterday at the Hurricane Oyster Bar, we decided to head back there for some more happy hour food and drinks. BTW, I realize some of you might not be familiar with the phrase ‘getting skunked’. No, we didn’t get sprayed by Pepé Le Pew. In surfing lingo, getting skunked means going to the beach with your board and finding no waves to ride. This time we were much luckier. We sat at the same outside table and the kids are becoming regulars and dove right into the free peanuts. I wasted no time getting an ice cold cup of domestic draft beer. Today’s selection, Amber Bock. It brings me back to my college days when anything better than Natural Light was considered a luxury. We ordered a lot more food this time around. It started with 2 dozen oysters. One dozen for me, one dozen for Marlene. Actually, it is more like 23 oysters for me, 1 oyster for Marlene. 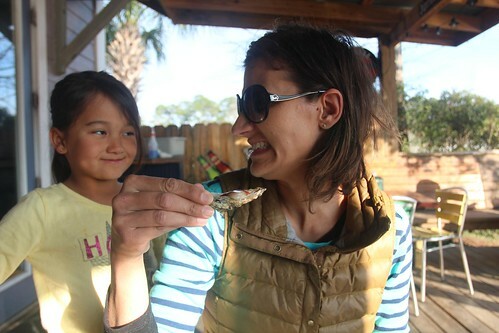 Marlene has never been a fan of oysters, cooked or raw. I think it has more to do with the slimy texture of it. Sure it has the consistency of a snot rocket in the midst of a sinus infection, but it tastes as great as the ocean breeze. I talked her into choking one down and she was a good sport and obliged. Here she is trying to enjoy the flavor while trying to ignore the texture. 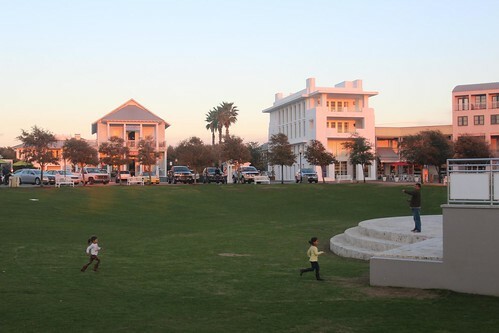 After the Hurricane Oyster Bar, we headed back down to Seaside’s town center. We ate so much there that we didn’t actually have any more room to do another round of the happy hour crawl. 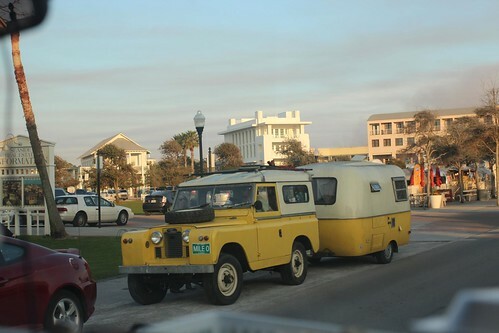 As we headed in, we saw this cool Landrover towing a cool little matching trailer. 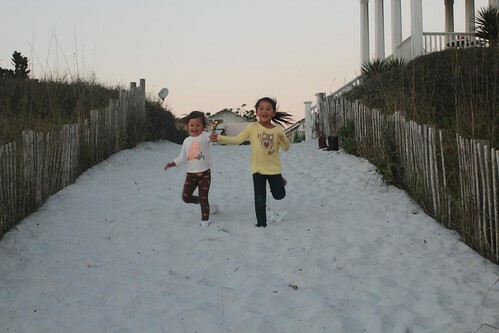 We remember seeing them at Cedar Key a couple days back when we arrived at the Sunset Isles RV Park. 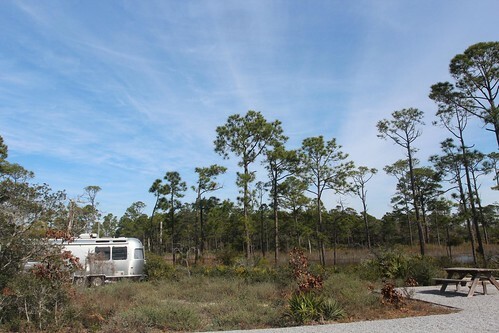 Before we got settled into our site in Cedar Key, they had already left. It is funny to see them here again as they are probably headed west on similar routes as we are. Just as last time, before we parked the van in the parking lot, they pulled away and headed out again. Here at the amphitheater, the girls alleviated their ants-in-the-pants by running around like crazy chickens. 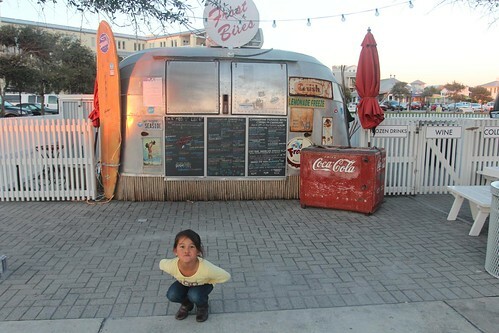 We intended to come here for the famous shaved ice at the Frost Bites Airstream food truck. Unfortunately we found out that it was closed. In the off season, many businesses like this are closed Monday through Wednesday. It’s too bad because we won’t get a chance to try it before we head out tomorrow. 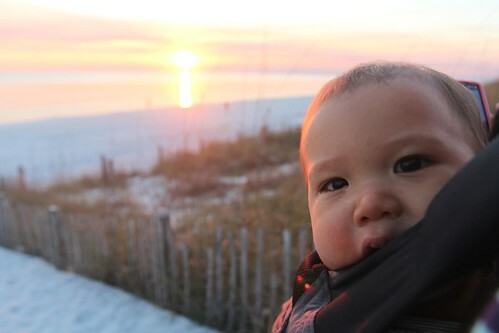 Getting skunked out of dessert, we decided to head down to the beach to see the sunset. 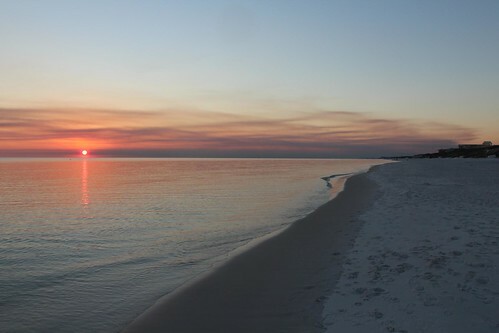 The Gulf sunsets are some of the most stunning we have ever seen since we have been on this trip. A close second has to be the west coast of Michigan where the sun also sets over the horizon behind the waters of Lake Michigan. 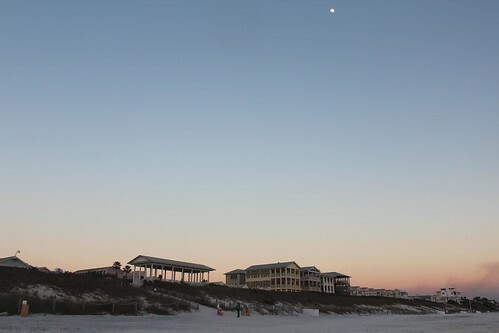 There were just a couple of people strolling on the sugar sand beach waiting for the sun to crawl behind the horizon. The water today is calm and glassy which made beautiful, gentle ripples for the sunset to reflect on. We are headed out tomorrow after our check out to continue heading west along the panhandle towards Alabama. With only a couple of nights left in Florida before we leave the sunshine state, we are trying to treasure these last few moments in its beautiful beaches. 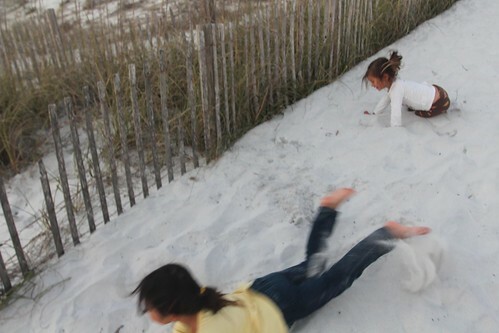 The girls do that by running hand-in-hand down the sandy walkway and face planting into the beach. 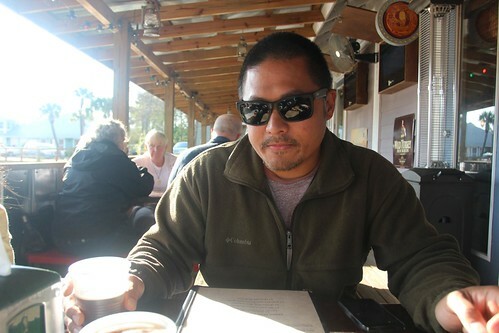 Day 172: Grayton Beach State Park and the Happy Hour Crawl. 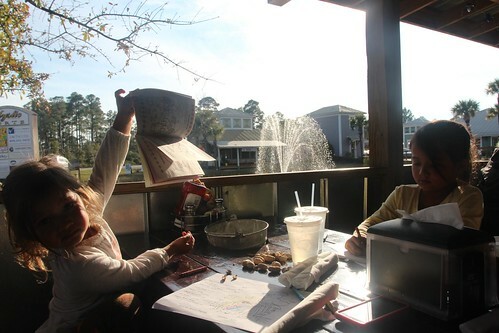 4 Responses to Day 173: Back to Hurricane Oyster Bar for more. The Land Rover and coordinating camper is so cool! I hope you get to meet them! @Jessica – I am so happy for you and your family! Hope to see you guys on the road! I love following your adventures on your blog. We are soon to purchase a new trailer, and while we are at the other end of the spectrum from you (kids are grown, we are retired), we hope to enjoy life on the road as much as you do. I hope you will get a chance to try our oysters in the PNW! However, I don’t think you will find the prices you found in FL!